Tomasello Spiced Apple Wine is a delicious combination of Autumn apples and mulling spices, conjuring images of fallen leaves under foot, good books by the fireside and watching snow fall silently with a plate of apple pie. Perfect for serving warm with melted Brie, toasted almonds and Granny Smith apple slices. Delicious on goblin nights, during Thanksgiving festivities, at your next tailgate party or after a good run down the slopes. 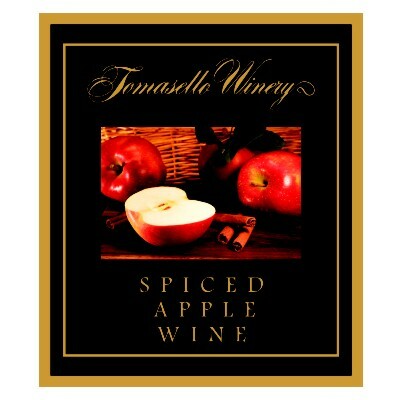 Tomasello Spiced Apple Wine warms the chill in the air and gives you something to look forward to! Tomasello Spiced Apple Wine is a delicious combination of Autumn apples and mulling spices, conjuring images of fallen leaves under foot, good books by the fireside and watching snow fall silently with a plate of apple pie. Perfect for serving warm with melted Brie, toasted almonds and Granny Smith apple slices. Delicious on Goblin nights, during Thanksgiving festivities, at your next tailgate party or after a good run down the slopes. Tomasello Spiced Apple Wine warms the chill in the air and give you something to look forward to, beside shoveling snow this winter!